As promised by President Duterte during his last visit at Camp Simeon Ola on January 29, 2018, the Provincial Government of Albay received the remaining cash assistance earlier this morning January 31, 2018 at Governor’s Office Dignitaries Hall. 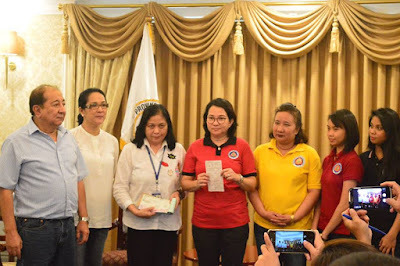 Amber Mirandilla, Presidential Management Staff, was tasked to hand over the cash assistance and was received by Governor Al Francis Bichara together with Mayflor Deang, the Provincial Treasurer’s Office head and Public Administrator, Engr. Vida Prollamante. A sum of 70 million is now on hand and an additional of 5 million from PCSO will be allocated to the municipalities affected by the Mayon Volcano’s hazardous actions. “We will order a lot of sacks of rice. Yun lang ang gusto nila. Yung sustainability ng pagkain nila.” Governor Al Francis Bichara emphasized. He also said that the allocation of budget of the LGU’s will be depending on the number of families on their evacuation centers. He mentioned receiving support from different national sectors both public and private. Governor Bojie Dy of Isabela extended his service by sending a thousand bag of rice. As for international support, Governor Al Francis Bichara said that they are negotiating now with United Nations for the tents. President Duterte and thanked him for the cash assistance. As promised by President Duterte during his last visit at Camp Simeon Ola last January 29, 2018, PGA received the remaining cash assistance earlier this morning January 31, 2018 at Governor’s Office Dignitary’s Hall. Governor Al Francis Bichara was asked to give a message to President Duterte and thanked him for the cash assistance.